In 2013, Kurtis J. Wiebe and Roc Upchurch's Rat Queens burst onto the graphic novel scene to a general cry of delight. As the blurb for Rat Queens, Vol. 1: Sass and Sorcery says, 'Who are the Rat Queens? A pack of booze-guzzling, death-dealing battle maidens-for-hire, and they're in the business of killing all god's creatures for profit.' Basically, they're an awesome-sauce gang of outrageous ladies. With their overwhelming quest for a destructive good time, their battle lust, and their defiant fashion sense, the Rat Queens provided the kind of rowdy, confident female gang many fangirls just couldn't resist. Every ninety years, twelve gods incarnate as humans. They are loved. They are hated. In two years, they are dead. The team behind critical tongue-attractors like Young Avengers and PHONOGRAM reunite to create a world where gods are the ultimate pop stars and pop stars are the ultimate gods. But remember: just because you’re immortal, doesn’t mean you’re going to live forever. The Wicked + The Divine is a statement comic. With its use of pop colours, opulent costumed gods and bold cover images, its art is as much about creating a fashion movement within the graphic novel world as it is about conveying story, artistic experimentation or investigating celebrity culture. It stands out, even in a world of graphic novels where every creative team is working to tie their creation to a distinctive artistic style which will get them noticed. Storm: Thief. Goddess. Headmistress. Queen. In 2014 and 2015, Greg Pak released 11 issues of a solo title focusing on the white haired, weather manipulating X-mutant Storm. I have always counted the X-Men as my first super fandom. I grew up with X-Men: The Animated Series in the 1990s. I have a list of favourite X-Men that has literally not changed since I was an eight year old tiny person (here they are in order if you're interested: Wolverine, Rogue, Storm, Gambit, Jean Grey). I even paid to see X-Men Origins: Wolverine in cinemas. And maybe it's just my British perspective (we do love to talk about the weather) but I think Storm is one of the coolest long term X-Men characters. Yet, this run of Storm comics seems to have gone a little under the radar despite the efforts of critics like Black Girl Nerds. Which is just ridiculous because just look at her on those covers. Today, Memory - the lady that comics built - explains the mysteries of the Hugo's Best Graphic Story category, and reveals ten award eligible comics she loves. My name is Memory and I'm a vocal comics-lover. This being the case, Jodie invited me to come by this week and talk to y’all about the Best Graphic Story category at the Hugo Awards. I want to say a bit about what qualifies for the award, how you (yes, you!) can nominate your favourite comics, and which 2014 releases I particularly recommend you check out. Today, all round media devotee Clare explains how she got hooked on Harley Quinn and why you should too. Harley Quinn got me into comics. Like every geek in the late nineties and early aughts, I had consumed a metric ton of anime and manga (Yu-Gi-Oh!, anyone? ), but, unlike every geek in the late nineties and early aughts, my only experience with Western comics was with my brother’s lovingly curated Asterix collection. A collection which I had vandalized as a small child and was thus banned from touching. After my brother went off to college and my father and I began raiding his possessions, I finally came across his Big Two books: Marvels, Kingdom Come, and, most importantly, Les Daniels’ Marvel. Daniels’ extremely biased account of the rise of Marvel gave me a quiet hankering for good old-fashioned superhero comics, although my fond childhood memories of Batman: The Animated Series and The Adventures of Lois and Clark steered me towards DC. I investigated the 1998-2003 Young Justice and liked what I saw (namely, nineties Superboy, who is my forever Superboy), but I could never quite get into it. Casting around for something else, I stumbled across the 2001 to 2003 Harley Quinn and devoured it in one of my teenage self-soothing media binges. So when the first issue of The Unwritten finally lured me into a comic book store in 2009 (it was a dollar! ), it made perfect sense to supplement that purchase with Gotham City Sirens, which started around the same time. I still give people that advice when they want to break into comics: find a character you like and just focus on them for a while to get your feet wet. Those two comics were the first in my now small but sizable comic collection, and Gotham City Sirens was the first comic I ever owned in its entirety in single issues. They’re special to me. But reading Gotham City Sirens made me realize how lucky I was to start reading Harley Quinn comics with, well, Harley Quinn. Vidder extraordinaire, beccatoria covers why, when and what to care about when it comes to comics (and then sets you free to make your own judgements). Lady Business accepts no responsibility if her recs cause you to lose your money and your heart in a comic book shop. So to begin, the title is a lie. At the very least it is misleading. I hope very much that this will work as a guide, but not as a one-size-fits-all feminist negotiation of comic books. I hope this will help you create your own guidelines — I hope it will help you decide on the angles of your own approach. If I had only one thing I could say to you it would be to set your boundaries and to guard them fiercely, but to make sure you are setting your boundaries. What should I care about? Get in our invisible plane, losers - it's time for a Lady Business theme week. Over the next seven days, we'll be presenting a host of posts about Super Women & Comics from a team of smart, persuasive readers and comics enthusiasts. And what better way to kick off the week than with words from Wonder Woman superfan, chaila? chaila has previously written posts about awesome action stars Sarah Connor and Mako Mori for Lady Business. Now she's back to convince you that Diana of Themyscira is essential to your life. You can try to resist her but, frankly, I don't like your chances. 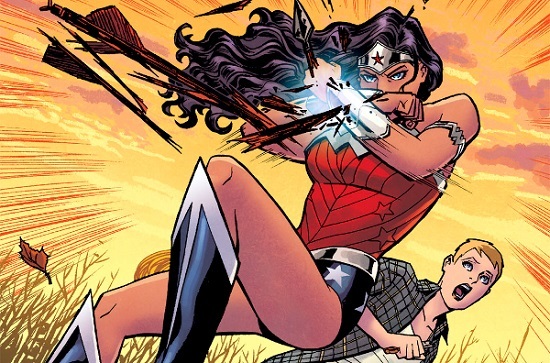 Wonder Woman might be the most famous superhero that people know the least about. Before I started reading Wonder Woman comics just over a year ago, I thought I knew enough to know I wasn’t interested. I knew something about an island of women, and something about bracelets that stop bullets. She seemed to be associated with a kind of “empowerment” feminism that didn’t seem very complex. I wondered why she couldn't wear pants. Mostly, I knew her as a vintage pin-up: a face on a t-shirt, symbol of superficial girl power, mostly devoid of content or context, who perhaps had been relevant thirty years ago and but didn’t really seem so today. Oh how much I was missing!